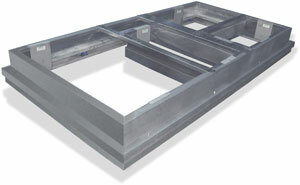 Spinnaker’s Isolation curb assemblies are available in 1” and 2”deflection models. These assemblies are provided of one piece heavy gauge steel construction , with mitered , continuously welded corners to provide adequate equipment support . Corrosion resistive steel springs are utilized with neoprene coated acoustic cups . The upper section remains captive so as to resiliently resist wind loads. Weatherproofing is achieved with the use of a continuous flexible non-abrasive seal between the upper and lower sections . Flexible duct connectors are factory installed with the final connection made on site. This feature completes thepackage and provides a quick, easy installation. Exterior surfaces of all welds are protected with a Zinc enriched coating , an optional enamel finish can be provided in a color that matches the installed equipment . Other deflection requirements can be provided as a special order.